Workplace romances are never advisable, but sometimes co-workers and business partners fall in love and get married. Unfortunately, they also sometimes fall out of love and get divorced. What happens next? 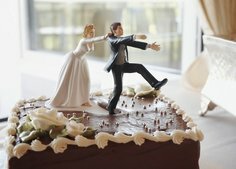 For some couples, the end of the marriage parallels the end of their working relationship—and possibly the end of the business itself. There are a number of options in such cases. The couple can sell the business and split the proceeds as part of the divorce settlement, or one partner can buy out the interest of the ex-spouse. Or they can try to split the business, with each taking half. Speak with an experienced business lawyer about the pros and cons of these options for your situation. However, some former spouses do figure out a way to maintain their business partnership after the divorce. The personal relationship may have hit a dead-end, but the investment involved in building and growing a successful company can make it hard to walk away—and unless the business is wildly successful, with plenty of prospective buyers waiting in the wings, it is feasible that neither party can afford to walk away. Sign a partners agreement. Be clear about your separate and joint responsibilities, and matters of liability. Make a contingency plan outlining how assets will be divided in case either partner decides to leave. If necessary, divide up responsibilities or tasks you once did together so you each have more autonomy. Establish a board of directors. Trustworthy business people may have valuable perspectives about the direction and goals of your company. Keep the company finances transparent. Money is often one of the most difficult issues in a divorce. Get help if necessary to streamline your accounting processes. Be professional around other staff members and employees. It is not fair to put employees in a position where they feel pressured to take sides or respond to inappropriate complaints about their other boss. A toxic work environment is never good for business. Even with the best intentions, a divorced couple may keep falling back into their old patterns at the workplace. If you still think that the business is viable and worth the effort to make a go of it, get professional help. A good marriage therapist is trained to help couples understand the point of view of the other person and gain insight into their dynamics, and this can be valuable information post-divorce, as well. Most entrepreneurs have a knack for thinking outside the box. Maybe you and your ex- can alternate day and night shifts for a few months. Build a partition between your desks. It might take a while before you move from being unhappy exes to friendly partners - but it just might be worth it.